Hey, ya’ll! I’m teaming up with a bunch of awesome 3-5th grade teacher authors to share some fun St. Patrick’s Day freebies. So, if you teach upper elementary, this should be right up your alley! My husband. He is my travel buddy, my listening ear, my interior decorator, my comic relief, my everything. My dog. She’s my best friend! My job and school. I work in the most positive atmosphere, have great students, and love what I do as a Spanish immersion content teacher. My partner teacher. She is 80% of why I love going to my job every day. She is my “figurative” wife, and I’m so lucky to have her! My country. Despite social/political disagreements all the time, I’ve visited many countries and I can wholeheartedly say, I’m SO lucky to have been born in ‘Merica! 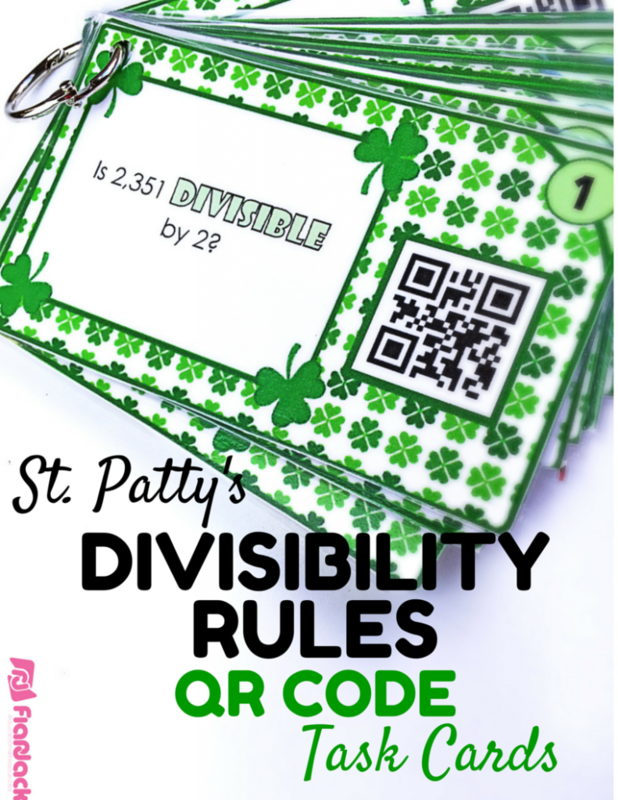 It’s a great little set of 12 QR code task cards for 4th-5th graders to review divisibility rules. My 4th graders actually completed this today. After a few lessons and a review about divisibility rules, I placed the cards around all the walls. Students paired up and solved the problems. But they did NOT scan the QR codes. Which is crazy for me, but sometimes I like a little more accountability. After students finished, we put away pencils, took out pens, and checked them as a whole group to see how they did. So I hope you can use this freebie. If you want to know more about QR codes, just head on over to my QR code page. You can also check out other FlapJack St. Patty’s Day freebies here. Now keep on hoppin’! I am so very HAPPY I get to introduce the next blogger in the hop (another reason I’m so lucky right now!). Her name is Marissa of Inspired Owl’s Corner. She is as sweet as she is talented, and she actually wrote one of my most popular guest posts. So click here or on her blog button to check out her blog and freebie. Happy St. Patty’s, teachers! That is great that you work in such a positive environment – you hear so many negative stories that it is good to hear of a great situation. I have an amazing teaching partner too – it makes all the difference! Love QR codes on task cards – makes for a great independent activity! Thanks, Elementary AMC! You're right – it makes all the difference! If she goes first, I don't know what I'll do! My teaching partner is also a big reason why I'm lucky!! I love all your QR code products; excited to try this one. Thanks for the great freebie!! Thank you, Kathie! Hope your kiddos enjoy it! Love the QR task cards and I cannot wait to use! Great! Thanks for stopping by, Martha! Oh, oh, oh!! These are going to be fabulous! Thank you SO much! Great! Thanks for stopping by, Tina! What a wonderful activity to review divisibility. Stopped by your store and found some some other amazing freebies and products I wishlisted :)!